January 17 marks twelfth night in the Julian Calendar. 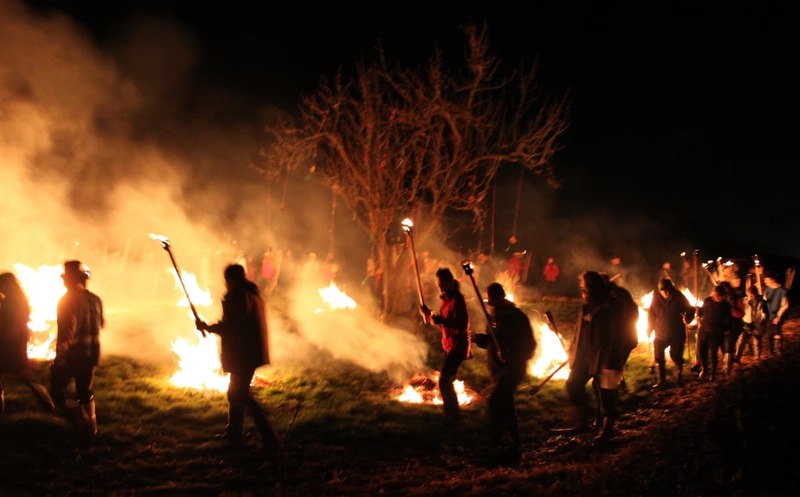 It also marks the traditional night of wassailing, a ritual to drive evil spirits from the orchard. If the Christmas period has left you with twelve drummers and twenty-two pipers, then today might be the day to visit your orchard of twelve pear trees and put them to work. January 17 is the traditional time for wassailing, a social event parts of England intended to lead to productive fruit trees in the coming year. Quite how old wassailing is, is uncertain though it’s probably medieval in origin. Academic research into wassailing has is not the simplest task. Palmer and Patten say: “Comparing the tunes is more difficult because transcribing a tape of half a dozen singers in varying keys and not completely sober presents its own problems; suffice to say they are closely related.” The event tends to follow local custom, but the process has a few common themes. The first is usually a procession to the orchard, often with music, noise and cider. The cider might have come from a local ale-house or, these days, from a food fair. Wassailing is becoming a hook for sales of local produce. Most of the cider gets to the orchard. At the orchard, a tree, usually the biggest or oldest is blessed. The wassail queen, king or local benefactor places a slice of toast soaked in cider in the fork of a branch of the tree to attract good spirits. Robins arriving to feed would be seen as a good sign, but that doesn’t usually happen during the wassailing, especially if it is done at night, because of what happens next. It’s not just good spirits that are the focus of wassailers. As well as inviting good spirits in, bad spirits must be driven out. People drive the evil spirits out by banging pots and pans, or possibly morris dancing. After removing evil spirits from the tree, the tree is given a drink of mulled cider. If the tree isn’t too thirsty, then the remaining cider is drunk by the wassailers. If the cider is good enough, more dancing happens. However, it’s never actually been properly tested. People have simply gone out and had a good time and a lot of cider each year. If you’re interested in testing if it does work, then fruit trees may not be the simplest plant to work with. So we in the office have reworked a traditional apple wassail to fit more with modern scientific practice. If it works for you, let us know. and hope data you will grant.